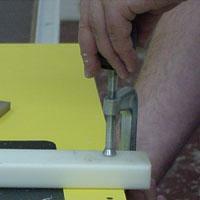 There are times when you are using a router bit that requires a larger opening than provided in the table fence. This can be easily modified but must be done safely! Follow these steps to make this change. 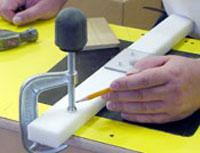 Position the table fence on the router table and clamp the out feed side. Keeping the fence angled to the right and well away from the router bit, plug in the router and turn it on. Swing the fence SLOWLY into the moving cutter. The bit shape (or profile) will be cut into the in feed side of the fence. 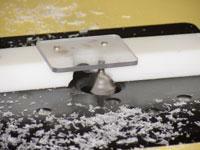 Be careful not to push it all the way through but far enough so there is clearance for the cutter. Turn OFF the router and unplug it. The exact profile of the bit which was just cut into the fence will act as a chip break when your work piece is being cut. Adjust the fence so that the desired amount of the bit profile is exposed. Be sure that BOTH ends of your fence are now clamped securely into place. Plug in your router, turn it on and make a test cut.